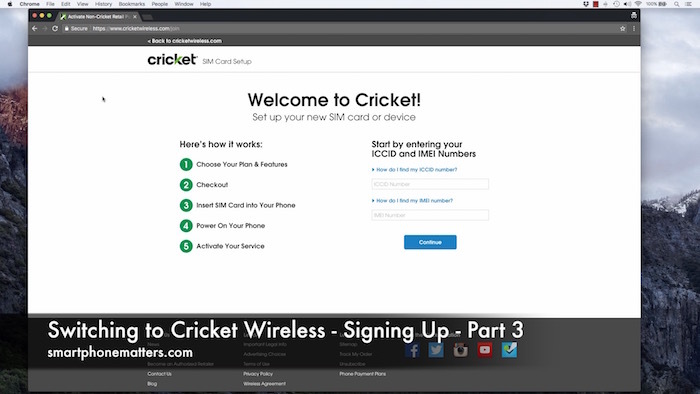 In this article and video, I show you step-by-step how to sign up for Cricket Wireless online. I signed up for their $30 monthly plan that includes Unlimited Talk and Text with 1 GB of High Speed data. This is part 3 of my switching to Cricket Wireless series. Check out my article and video below. Since I already have my Cricket Wireless nano SIM and a $40 Refill card I was ready to sign up. To get started I entered my ICCID and IMEI numbers on the right and clicked Continue. Your ICCID number is printed on the plastic add your SIM is attached to. Your IMEI number is your phone’s serial number. You can find it by dialing *#06# on your phone. After clicking continue it asked me if I’m a New Cricket Customer or an Existing Cricket Customer. I chose New Cricket Customer. I chose the $30 plan with 1GB of high speed data. Since I chose the $30 plan, the only two available Add-Ons were a free Deezer trial and Add 1GB of High Speed Data for $10 a month. I skipped both add-ons and clicked continue. I had to either choose Get a New Cricket Number or Transfer My Number. I chose to transfer my number and clicked Get Started.. After that I entered my phone number and clicked Submit. After clicking submit it said the transfer looks good and reminded me not to cancel my current service until the transfer was complete. Note that your Account PIN isn’t the PIN code you use to unlock your phone. Its a security code for your account information. Call you current phone company if you don’t know this information. After getting my info ready I clicked submit. Next, I ended up in the cart. It showed my SIM card number and the $30 plan I selected earlier. I clicked continue. To create my account I entered my name, email, choose a userid, and select a password. For Payment Info, I entered my address and then has a choice to either enter a credit card number or a Cricket Refill card number. I entered my address and used that $40 Cricket Refill Card I had earlier. After entering the information, there was an option to enroll in Auto Pay. I skipped that for now, since I don’t qualify for the discount. Next, I entered the account number and PIN for my current wireless provider so I could transfer my number. I clicked Continue. Finally I reviewed my information and clicked Place Order. install the cricket app after activation. Once my order was complete, I received an Order Completion email from Cricket. I completed the sign up process about 11:30 PM. The next morning I received an important update email from Cricket that stated my phone number transfer was delayed and I should contact support. I called support and they told me the transfer was scheduled for 11 AM that morning. Around 10:30 AM I received an email that I was ready to activate. At this point, I wasn’t ready to activate. My wife took her iPhone SE to work that morning. Her existing wireless service remained active all morning. Later that evening, I clicked the Activate button inside the email I received. I was redirected to the cricketwireless.com and my service was activated. Once my service was activated, the now-old-SIM no longer has service.. I was able to put the Cricket Wireless nano SIM in the iPhone SE. Shortly after, the status bar displayed cricket. After that I decided to make sure the iPhone was working. I was able to make and receive phone calls. I set up Visual Voice Mail and it worked properly. I checked to make sure I could send and receive both text messages (SMS) and picture messages (MMS). I exchanged messages with my Nexus 5X Android phone to make sure that Messages were using SMS and MMS. Finally, I ran a couple of speed tests. The speeds were slow. No where near 8Mbps down. That was expected as the AT&T network isn’t never too fast at my desk. I plan on running some more speed tests and will do a video comparing Cricket Wireless with Straight Talk’s AT&T network. I recorded the Speedtest video today. It should go up this weekend. After I post it I’ll answer any questions.